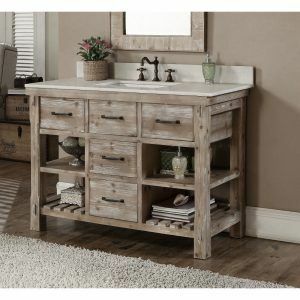 Today we gonna talk about the charming ideas of the bathroom vanities made in a rustic style, but first let’s remember what this style means generally and which details can describe it the most. This interior style is really perfect for those who is tired from the madding crowd, the crazy city right and all it’s madness. The rustic style with its simple and warm style will truly heal your soul from stress and can be described with the untreated wooden surface, natural stones, modern metal elements which are gonna complete the whole ensemble with the shining and a modern effect. Talking generally, rustic is a typical countryside which means “nothing over minimum” of what that for its place in the typical village wooden houses of the last century. The modern village style called rustic takes as an example the old rules of the house making mixing it up with the new born style which is actually really esthetic, but functional at the same time. The rustic bathroom will perfectly fit the wishes of those who want to copy the chic of SPA, but adding a bit of natural cosyness. 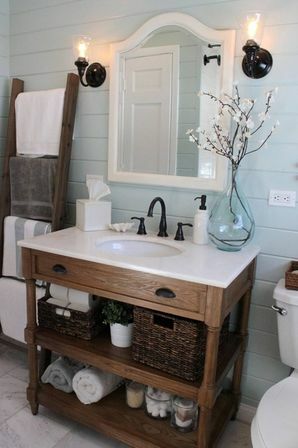 At the same time, letting you relax this kind of bathroom will daily take you to the simple and serene world that will quickly turn into the homemade reserve. So let’s go from the general to details and give you some inspiring ideas. 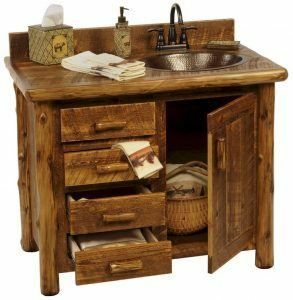 3 rustic bathroom vanities ideas. The availability of lots of wood is really common and almost classical solution for a house made in a countryside rustic style, but you know what gives it the real chic? Right! The natural stone details! You know why? 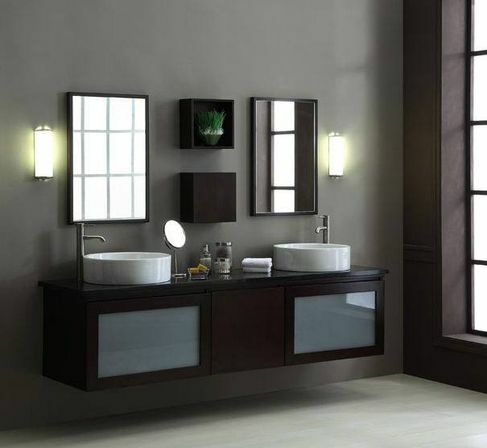 Because it will become the last decisive point at making you bathroom looking esthetically balanced. The walls made in stone in a combination with the wooden floor and ceiling will make the compelling atmosphere which is gonna be totally different from the rest of the houses zones. 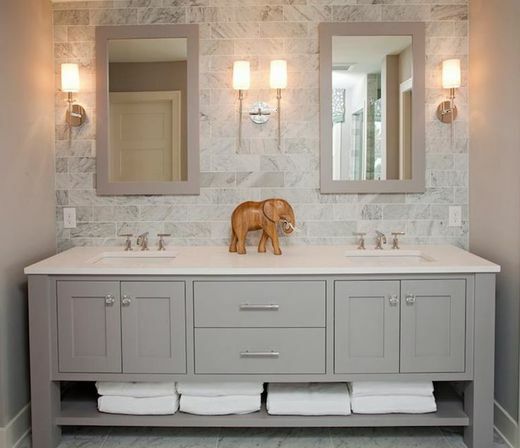 Don’t worry if the rest of your house is made in a more elegant and modern way because it’s exactly what’s gonna make your bathroom looking super attractive. The same technique we can use for the decorating or the bathroom vanity. The most popular way is to use the stoned in the tabletop decorating. There can be used some kind of pebble sanded stones, few bigger once having the same kind of texture or it can be even a single huge sanded stone having the natural shape with the sensed angles not to hurt you. 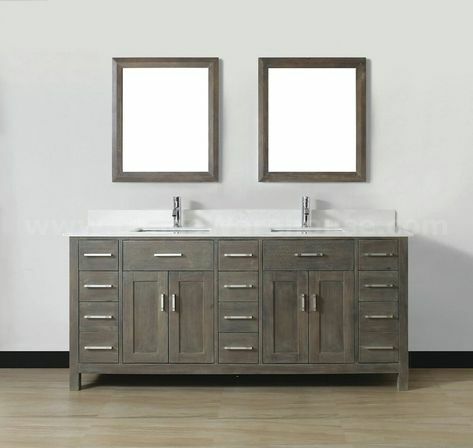 You can turn your basic looking bathroom into the most expensive looking place in the house just by using the wooden bathroom vanity and completing it with some other decorative elements such as ancient looking sink and establishing a huge mirror in a copper frame. 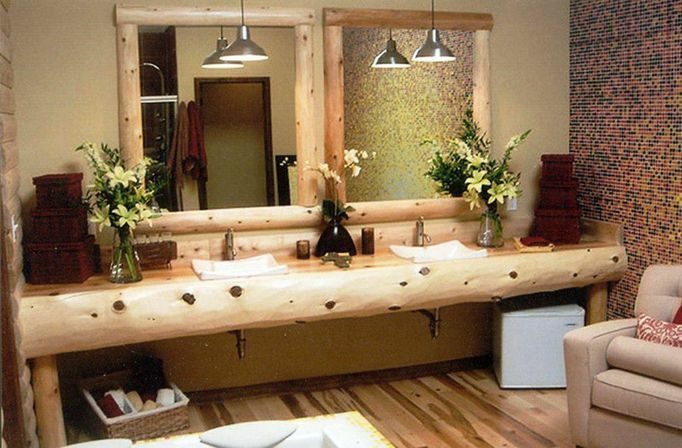 The main bathroom vanity can be done just from the old tree trunks or the weathered wooden panels. 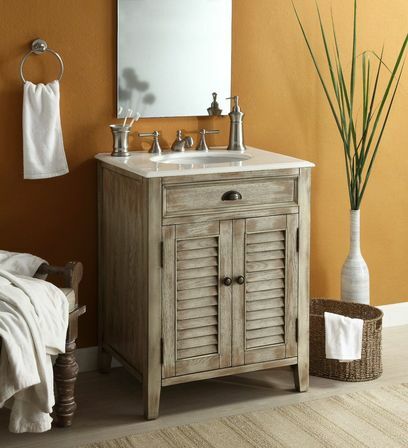 That’s all – the gorgeous looking bathroom is just here! 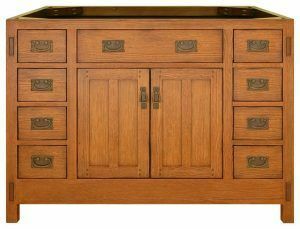 The bathroom vanities made from the copper. 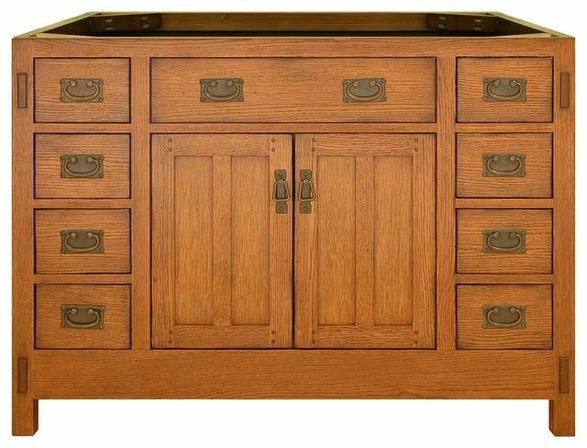 It’s been a long time that the it’s been fancy to establish a copper single standing bath in the middle of the room, but let’s don’t forget that everything new is a good forgotten old and surely now it’s coming back. 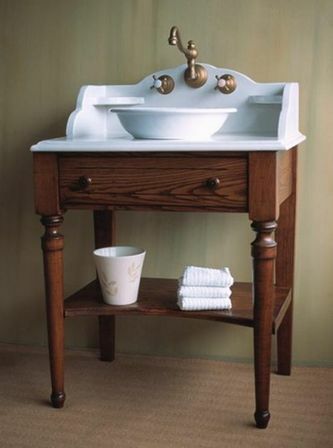 Of cause it looks gorgeous and super stylish, but what is more important this element surely should be completed by the other elements such as bathroom vanity with a copper sink. Here we come to the good designing style called art-deco as it also perfectly fits the rustic style just making it a bit more vintage, let’s say. Ate-deco and vintage together made such a new style that gave us the bathroom vanities made from the stone and the copper combining all good from the past and the best from the new styles. Moreover, in a daytime if there are the windows in the bathroom the copper is gonna start to shine so smooth and magnificent, so it’s gonna immediately become the main detail of the whole bathroom atmosphere. Let’s don’t forget that rustic is one of the country style’s orientations, moreover it has the western roots. This style got explored when the citizens being super stressed with the city life started to get nostalgic with the good warm countryside life. So even unconsciously they were trying to remake the good old atmosphere that makes them feel safe and comfortable. Based on this conclusion, we can say that rustic style is all about that good old village’s deliberate rudeness, the negligence of the wooden and molding textures. The used colors should be definitely taken from the natural gamma such as beige, the shades of the rising sun and the young wooden branches. Or you should go opposite and choose all the dark shades that the nature provides such as dark earth colors, the colors of the stones, emerald grass and clay. So now you can definitely see that rustic style is perfect for the bathroom as its really original and attractive. 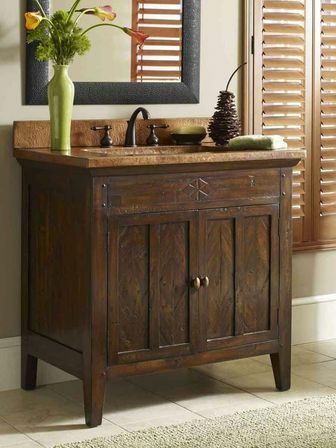 6 rustic bathroom vanities styles. Bathroom vanity made in chalet style surely has the unrepeatable chic. 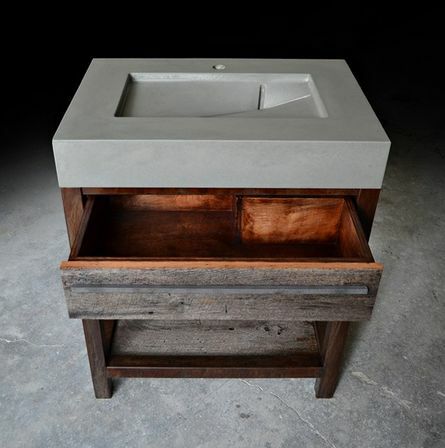 The coarse stone, chopped wooden forms in a combination with a rounded ceramic makes an amazing texture play. You can choose the traditional gray gamma of the beige color to accent the attention on the harmonic combination on the separately interesting details. 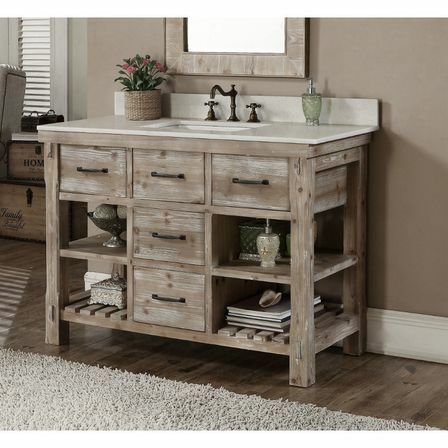 The bathroom vanity made in a rustic style is always described by the beige and generally light colors. Even more nobly it looks on the background of the ground color associating with the color of the coffee beans, the clay or the malachite flowers. You can accent the attention on the contrast of light and dark by adding some rainbow shining of the mosaic texture. 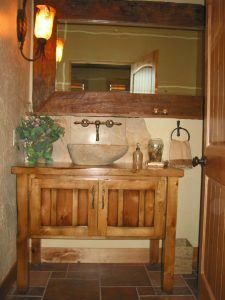 You can use rustic style not just to accent the attention on the coarse side of it, but also to make it looking smooth with no lusciousness, but instead keeping all the best that nature gives. That’s why it’s called a fairytale because it brings you not just to the village house, but to the forests and the rivers around. The combination of two different worlds. 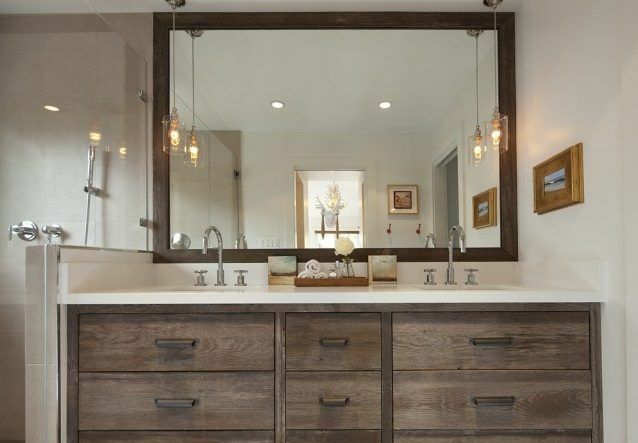 Such interior elements as the paintings, candles and the mirrors in the copper frames can make your bathroom vanity looking unbelievably bohemian still being made in a rustic style. 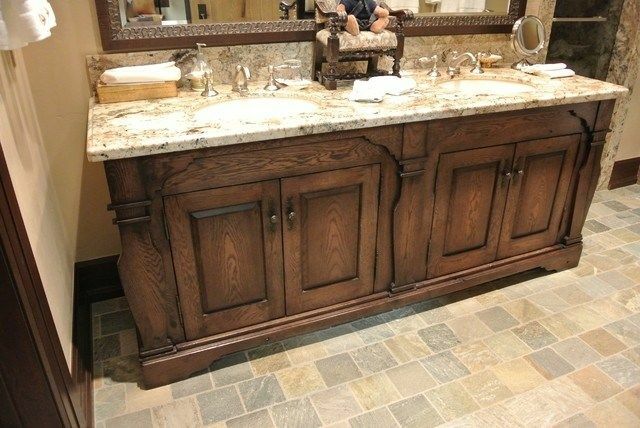 The wooden surfaces cut made with the stones and ceramic tile imitating the natural granite, the chrome sanitary engineering sand rich Damascus patterns gonna look just gorgeous. It’s mane idea is a rethinking of the interior basing on the wishes and the owner’s personality. So basically yeah, it’s the technique of the two worlds which combines the the secular lifestyle and the aspiration of the owners to the privacy. The new form of the village cosines. A-LITTLE-GREEN studio represented a way new look of the rustic interior on the example of the small city bathroom. 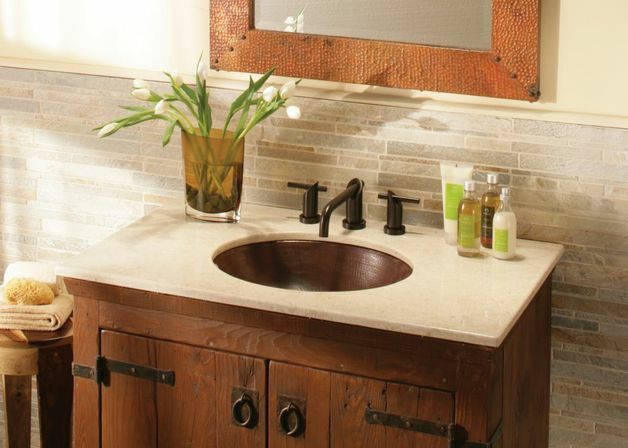 Here the modern rustic looks perfect made from the imitation of the marble, granite or the brickwork. The conceptual lighting combined with the designed glass partitions and the bathroom vanity top made from the wood will make a way new look of the village cosines. 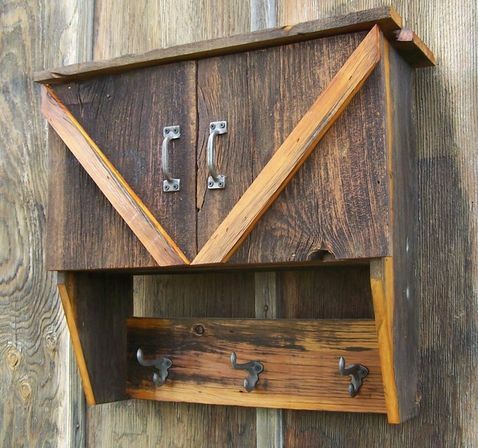 This rustic style got its name for its unusual way of looking. The main thing is that it’s done by some kind of the replacing the Russian traditional bath to the modern way of architecture and design such as lots of glass, chrome, and metal. Here the bathroom vanity can be made from the stained wood combining the traditional rustic negligence and the practical side of the modernism.